Mr. Papi returns for more hamburger-munching madness. Publisher Sunflat has a whole line of Mr. Papi games for iPhone that challenge you to bounce him onto platforms and guide him up a river without touching the shore. Now he returns in the enjoyable PapiJump Land, a platform adventure where the goal is to complete stages by devouring specified amounts of hamburgers. PapiJump Land's controls were built to take advantage of the iPhone's accelerometer. To play, you tilt the device in whatever direction you want him to go. Papi always bounces, and you'll succeed so long as you use his shadow to gauge where he'll land. Doing this, of course, is easier said than done. 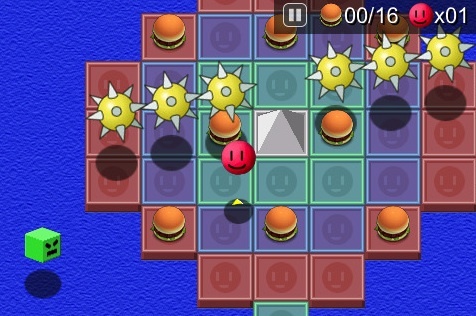 The game's 30 levels include narrow pathways, spiked balls to hop over (or bounce under), moving platforms and other obstructions that make snagging those burgers a royal pain. Plummeting into the water or hitting a spike costs you a life, but unless forced to continue, you'll always retain previously acquired hamburgers, allowing you to focus on the ones remaining. Despite lacking a competitive edge (there is no online leaderboard), PapiJump Land is a fun app that'll keep you busy for a couple of hours, and gamers with an interest in the series should download it ASAP. What's Hot: Mr. Papi, lots of challenging levels, tight accelerometer controls, digital hamburgers make our tummies growl. What's Not: You cannot post scores to an online leaderboard.